I have three of these rugs in my home and I absolutely love them. Beautiful colors, craftsmanship and quality. I am a huge fan of Safavieh wool rugs. 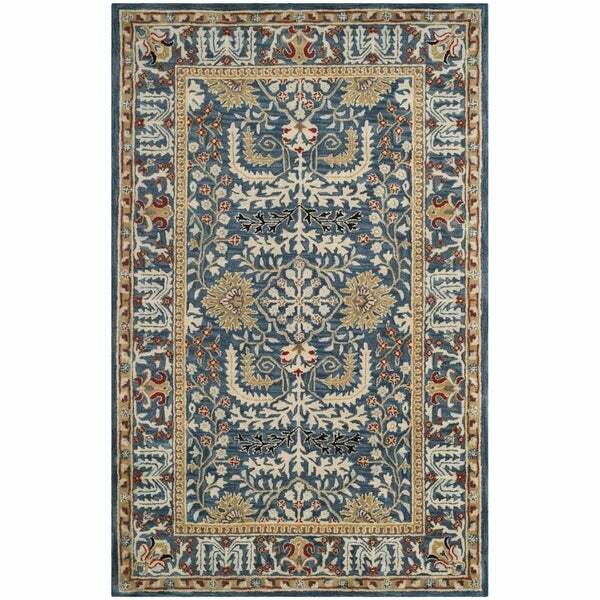 Elegant designs and rich colors of this rug is inspired from the 19th century antique Persian rugs. Premium wool is used with a luster wash finish to give it a soft silky finish to ensure this is one of the most luxurious rugs. Another favorite Safavieh rug! I love Safavieh. 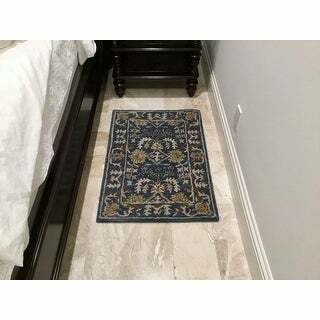 Their rugs are always high-quality, always the best colors, and thick and soft. The blue in this rug goes with my denim and slightly periwinkle shades of blue..
Beautiful, thick wool rug. Looks very expensive. The color is not dark blue as advertised but a very pretty soft medium blue. Beautiful thick rug! The blue is more of a medium tone, not dark blue. I bought a larger rug that matches this first. We all loved it so I bought this one for under the piano stool. The colors are a little off and not quite as bright as the larger rug, but since they are not close together it doesn't matter so much. Definitely feels like quality under your feet. Great rug, bought in in several sizes and absolutely love them all. Nice and thick, some shedding but nothing unusual for a wool rug. Cannot say enough about this Safavieh wool rug. Love the pattern and even though it was tightly wrapped it unrolled without any problems. They match all the other rugs from this collection. Beautiful rug, looks great under my small oak antique side table. I have many compliments, this rug looks like I paid much more for it, love it. 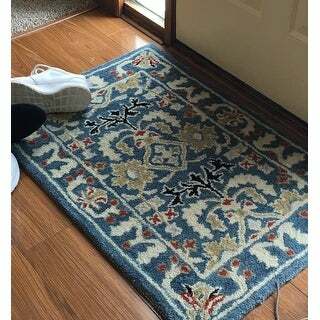 Great quality rug. Tight thick pile that is plush underfoot. Colors are brighter in person than on my screen and we like it better than we expected. Just as pictured, good quality, very nice price! Using them next to the bed on tile floor. They are really thick and tightly woven. Very comfortable with old-fashioned loop construction. Not the quality I thought they were! If you sweep the rugs you will be buzzy cleaning out the sweeper. The colors are soft as indicated in the picture. It wasn’t as sumptuous as I’d hoped so back it went! Love the colors and the pattern. Looks like it is well made.